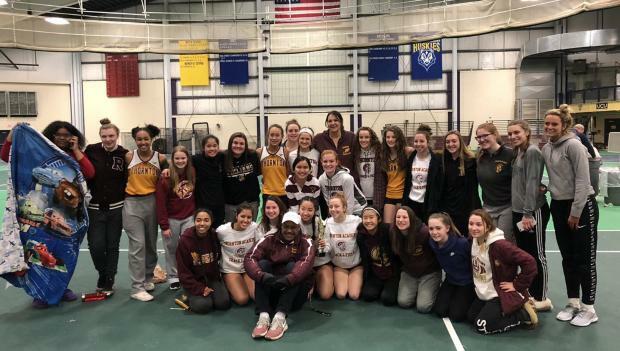 Thornton Academy girls & Scarborough boys win team titles. It was a record breaking Southwesterns as the record books were rewritten with tremendous performances in the field and on the the track as fourteen league record fell. On the boys side Scarborough won it's ten straight team title as the Red Storm tallied 216 points, the second highest total in league history. Falmouth scored 96 as they edged Thornton Academy by 1.5 points. The Red Storm were lead by outstanding regular season athlete Jarett Flaker who won three sprints setting league records in each race. First up was the 55m dash where he set a new personal best of 6.48, lowering his own record .02, the time is the second fastest in state history. In the 400m Flaker broke the six year old record of 50.47 of Biddeford's James Ociti with his record breaking run of 50.45. The junior wasn't done as he stormed out of the blocks in the 200m stopping the clock 22.49 lowering his previous record of 22.57. For good measure he would get the stick trailing Falmouth in the open 4x200m relay and regained the lead for Scarborough, the Red Storm winning time was 1:34.43. Senior Anthony Clavette added a win in the high jump with a 6-4 clearance, he also finished second in the triple jump with a personal best 41-4 1/2 leap. Junior Ben Hatch leaped 21-6 1/2 to win the senior long jump, he also finished third in the 55m dash. Also for the Red Storm senior Noah Drapeau was the winner of the 600yd race in a personal best effort of 1:17.12, while freshman Jayden Flaker ran 7.94 to win the junior 55m hurdles. Gorham Freshman Andrew Farr swept the junior division sprints as the standout ran 6.62, 52.94, and 23.31. The latter was a league record in the 200m, breaking Jarett Flaker's two year of mark of 23.39. His teammate Ryan Gendron added the record breaking in the junior high jump as he set a personal best of 6-0 1/2 to better the year old mark of 6-0 1/4 set by Andrew Ladd of Kennebunk a year ago. Thornton Academy senior Jason Montano broke the league oldest record in the senior shot put as he threw a personal best 63-0 to surpass Edward Bogdanovich's 42 year old mark of 62-1. His mark currently ranks him fourth in the US. His teammate Travis Snyder cleared 15-6 to win the pole vault, he added another win in the senior hurdles in 8.06. Westbrook junior Mahamed Sharif put together an impressive performance in the senior 800m as he took the pace from the gun and never looked back. Sharif erased the two year old mark of 1:58.72 with his winning effort of 1:57.88. Jr High Jump Ryan Gendron (Gorham) 6-0 1/2"
The girls meet was close and exciting throughout with three teams in contention. In the end the Thornton Academy girls pulled out a three point victory over Gorham 110.5 5 to 107.5. Cheverus was third with 103. The Trojans had two individual winners on the day, and a relay win, as they relied on depth to win the title. Sophomore Sarah Montano cruised to the win in the junior 55m hurdles with a personal best 9.03. In the senior 55m dash Sabria Merrifield clocked a personal best 7.51 to win the event. Mia Taranko provided key points to the title run with a runner-up finish in the long jump (17-0 1/2), followed up with a 7.71 third place finish in the senior 55m dash, she added 3 more points with fifth in the triple jump. Freshman Mia-Claire Kezal played a big role in the win as she ran a leg of the third place 4x800 team, then finished third in the junior 400m in a personal best 62.98, next up was the junior 800m where she finished on short rest. Her anchor leg in the 4x400m sealed the win as she battled Bonny Eagle to the line edging the Scots by .18. Gorham was paced by distance ace Kate Tugman who had a busy day on the track. Tugman won the mile in 5:18.06 after setting a blistering early pace. She deployed the same strategy in the senior 800m as she sped out to the early lead and never looked back stopping the clock at 2:25.47. Tugman dominated the 2 mile with her 11:32.21 winning effort. Cheverus sophomore Victoria Bossong had records on her mind as she broke all three junior sprint records. Bossong opened with a 7.34 effort in the 55m dash lowering her week old mark of 7.41. In the 400m she broke the all-time state record in the event with an excellent time of 57.05, the previous mark was 57.52 set three years ago by Elisabeth Redwood of Bonny Eagle. She wasn't done breaking records though as she lowered her own record in the 200m down to a new personal best of 25.70. Nyagoa Bayak of Westbrook made her final indoor Southwesterns a memorable one she broke her own league record in the senior high jump clearing a new indoor personal best and state record 5-11. The mark currently ranks third in the country. Bayak wasn't done though as she upped her own senior triple jump mark to 38-2 1/4 to win the event. Scarborough's Emily Labbe won the senior hurdles, and lowered her own senior hurdles record set a week ago down to 8.43. Marshwood's Rori Coomey set a Class A leading mark in the long jump with her personal best jump of 17-6, while Gorham freshman Alyvia Caruso was the runner-up with a fine effort of 17-3 1/4. In the shot South Portland's Rebekah Hunnewell-Dunphe set a new personal best and Class A leading 36-8 1/4 mark to win the senior shot put.